Omega represents reliability and precision, a fact the astronauts of the Apollo missions came to appreciate on their trips to the Moon. Innovations like the co-axial escapement and Master Chronometer have only added to Omega's stellar reputation. Omega has been around since the mid-19th century and has earned a reputation for making reliable, precise, and functional watches. Omega has a long, rich history of developing new watchmaking technology. They created the co-axial escapement as well as an especially effective form of protection against magnetic fields. Such innovations help protect Omega watches against jolts and magnetic fields of up to 15,000 Gauss. Omega produces some of the most famous watches in the world: Their Speedmaster Professional , for example, accompanied the first astronauts to the Moon in the summer of 1969. Professional and recreational divers alike have been relying on the Seamaster for around 60 years, and this watch has also made numerous appearances on the silver screen as James Bond's watch in various movies. Aside from their technology-heavy watches, Omega features classic, elegant timepieces such as the De Ville, Constellation, and Globemaster. Materials like red and yellow gold emphasize the luxurious quality of these watches. 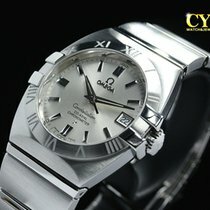 How much do Omega watches cost? Without a doubt, one of Omega's leading models is the Speedmaster Professional Moonwatch . First presented in 1957, this chronograph does its name justice. NASA began outfitting its astronauts with this timepiece in the 1960s, and it went down as the first watch ever on the Moon when the astronauts of the Apollo 11 mission set foot on the lunar surface in 1969. Since then, Omega has released numerous versions of the Moonwatch. The Speedmaster Professional is the closest thing to the original model. You can purchase this timepiece with a manual movement, historically accurate plexiglass, and a stainless steel case back starting around 3,600 USD. If you prefer the variant with sapphire glass on both the front and back, be prepared to spend an additional 700 USD. Vintage models from the 60s sell for between 7,600 and 10,700 USD. Models popular among collectors, such as the Speedy Tuesday, the steel version of the Apollo 17 45th Anniversary, the Dark Side of the Moon, and the Co-Axial Master Chronometer Moonphase, sit in a similar price range. You'll need to dig a bit deeper into your pockets for even more highly coveted models like the Snoopy or Moonwatches with gold cases. These pieces easily fetch prices of between 12,800 and 20,900 USD. In addition to the various versions of the Moonwatch, this collection features a slew of other interesting editions of the Speedmaster. For example, Omega pays tribute to the original Speedmaster from 1957 with the Speedmaster '57. The Racing and Mark II are also closely related to their predecessors from the 50s and 60s. These models come in at between 4,500 and 6,400 USD. On the other hand, the Speedmaster 38 is aimed more at a female audience. You can purchase this 38-mm gold watch with diamonds for about 7,100 USD. If you prefer something a bit more modern, you may enjoy models likes the Skywalker X-33 and the Spacemaster Z-33. These multi-functional quartz watches offer a number of functions in addition to their analog and digital displays, including a second time zone, chronograph, perpetual calendar, and an alarm. Plan to spend between 4,200 and 4,800 USD for one of these models. The Seamaster collection is yet another cornerstone of the Swiss manufacturer's catalog. High water resistance characterizes each of the collection's various models. One of the series' most famous models, the Seamaster 300 , is water resistant to 300 m (984 ft). Prices for current models range from 4,500 USD for the stainless steel model to 23,300 USD for the version made of Omega's own rose gold, called Sedna gold. Vintage models from the 60s cost about 8,900 USD in good condition. The Diver 300M, Planet Ocean 600M, and Ploprof 1200M are all geared toward professional divers. Watches in these lines are water resistant to 300 m (984 ft), 600 m (1,970 ft), and 1,200 m (3,937 ft), respectively. They also include professional features like a helium escape valve and a security pusher for the diving bezel. Depending on the material, expect to spend between 7,000 and 13,100 USD on the deep-diving Ploprof 1200M. The Omega Planet Ocean 600 is between 37.5 and 45.5 mm in diameter. You also can choose between a stainless steel or gold case. Prices for the three-hand model in stainless steel sit around 4,900 USD, while those for watches with gold cases range from 16,200 to 19,200 USD. The chronograph version of the Planet Ocean 600M costs around 6,300 USD in stainless steel and 22,700 USD in gold. The Diver 300M also is available in men's and women's sizes as a three-hand watch or a chronograph. You can purchase a stainless steel model with a 28 to 44-mm case for between 1,600 and 4,200 USD. Limited edition pieces, such as the titanium Diver 300 ETNZ, can cost as much as 5,400 USD. This timepiece is dedicated to the sailors of the Emirates Team New Zealand. The Seamaster series features three more interesting models: the Bullhead, the Railmaster, and the Aqua Terra 150. The Bullhead is of particular interest, as its shape resembles that of a bull's head and it is popular among both collectors and fans of unusual timepieces. Models from the current collection demand around 7,000 USD. If you prefer this chronograph's vintage models from 1969, be prepared to spend an additional 4,700 USD. The Railmaster has been a part of the Omega catalog since 1957 and was originally developed for people with regular exposure to strong magnetic fields. The most recent models can withstand up to 15,000 Gauss and sell for around 4,000 USD. Prices for models from the 50s are 60s can quickly rise to about 15,700 USD. 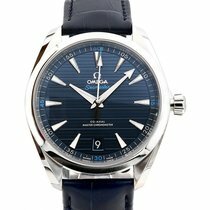 In the Aqua Terra line, Omega combines the straightforwardness of a tool watch with the elegance of a dress watch. The various models are available with gold and diamonds as well as mother-of-pearl dials and crocodile leather straps. You can get a simple model in stainless steel for as little as 4,000 USD. Those with a GMT or chronograph function require an investment of around 5,800 USD. When gold and diamonds are added to the mix, prices can range anywhere from 13,200 to 40,800 USD. Omega takes a less technical approach to their Constellation series compared to the Speedmaster and Seamaster collections. The Constellation has undergone a number of changes since it was first introduced in 1952. Early models were simple and elegant wristwatches with three hands. Since the 1980s, many models feature a fixed bezel with Roman numerals. Some Constellation watches have so-called 'claws,' which are slightly raised parts of the bezel at 3 and 9 o'clock. As the designs were modernized, high-quality quartz movements were introduced to improve accuracy. Since 1967, Omega has also offered a Constellation series for women. Certain pieces in this collection are distinguished by gold and decorative diamonds. These ornate timepieces easily change hands for between 29,200 and 44,300 USD. On the other hand, simpler models in stainless steel range from as little as 2,100 to 4,700 USD. You can even find vintage models from the 60s for well under 1,200 USD. The De Ville series is a touch more classic than the Constellation. The series, introduced in the 1960s, appeals to an audience similar to that of Blancpain or Breguet. This series features classic, clean designs with Roman numerals; movements with tourbillons; and cases made of white, rose, and yellow gold. Many of the women's models also feature diamond-studded bezels or diamond hour markers. Here you will also find vintage pieces for under 1,200 USD. Depending on the material, current models range from 7,900 to 25,100 USD. A platinum De Ville Tourbillon with a skeletonized movement comes with a hefty price tag of around 254,000 USD. The history of Omega goes back to the 19th century. In 1848, Louis Brandt began manufacturing pocket watches in the city of La Chaux-de-Fonds, in the Swiss canton of Neuchâtel. He made arrangements with local suppliers, which allowed him to sell his products to a wider market, including in Italy, England, and Scandinavia. Later, Brandt's sons moved the company to its current location in Biel. Although the name Omega had been in use since 1894, it was first officially registered in 1903 when the third generation took over. The name is meant to express the quality of their watches. Omega is the last letter in the Greek alphabet and is often used as a metaphor for perfection. In 1930, Omega and their competitor, Tissot, made a joint decision to serve separate markets. Omega was to focus on the luxury watch sector and Tissot on the middle class. When the quartz crisis put the Swiss watch industry in a difficult position, the two brands came together in 1983 under the newly formed Swatch Group. Omega remains part of the group to this day. Omega has garnered attention over the decades for their technical innovations. In 1892, the manufacturer introduced the first wristwatch featuring a minute repeater, a particularly intricate complication that uses chimes to relay the time. Omega was responsible for timing all of the events at the 1932 Summer Olympic Games in Los Angeles, and they introduced automatic timers for the first time at the 1952 Summer Games in Helsinki. The manufacturer reached a new level of precision with their quartz chronometers introduced in the 1970s. A high point was the caliber 1525, which was used to power the marine chronometers used by the French navy. It was specially made and delivered in a box made of precious wood with a brass coating. Over the course of a year, these chronometers deviate from the exact time by less than five seconds. One of the Swiss manufacturer's more recent achievements is the development of watches that are highly resistant to magnetic fields. In October 2013, the Seamaster Aqua Terra marked the beginning of a new generation of watches. These timepieces make use of anti-magnetic silicon, which allows calibers to remain unaffected by up to 15,000 Gauss of magnetism. The watches with these features bear an official Omega quality mark developed in 2015. Many prominent figures, both in real life and in fiction, have been drawn to the allure of Omega watches. The most famous wearer may very well be secret agent James Bond , who wore a Seamaster in the 1995 film GoldenEye. The French oceanographer Jacques Cousteau also relied on the Seamaster during many of his dives. Elvis Presley, the King of Rock and Roll, wore a Seamaster Calendar in 1960 when he was promoted to sergeant while stationed in West Germany. However, it isn't only kings who recognize the value of the brand. The former US President John F. Kennedy, the former Chinese Chairman Mao Zedong, and the former Soviet leader Mikhail Gorbachev all wore Omegas; Gorbachev selected a golden watch from the Constellation series. Likewise, actor Tom Hanks wears an Omega Speedmaster Professional as a reminder of his role in the film Apollo 13.